Zion Market Research has published a new report titled “Antimicrobial Additives Market by Product Type (Inorganic Antimicrobial Additives and Organic Antimicrobial Additives), by Application (Plastics, Textiles, Paints & Coatings, and Pulp & Paper), and by End-User (Healthcare, Packaging, Food & Beverages, Construction, Automotive, and Others): Global Industry Perspective, Comprehensive Analysis, and Forecast, 2018–2025”. 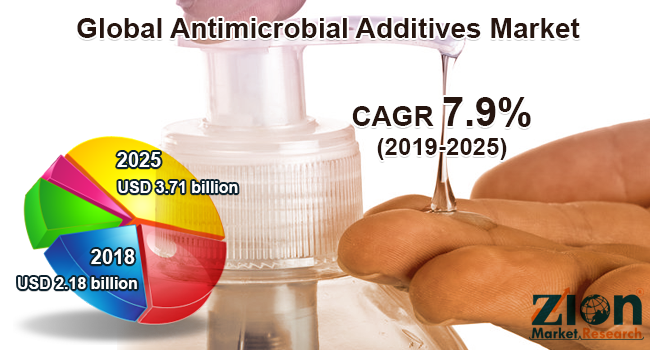 According to the report, the global antimicrobial additives market was valued at approximately USD 2.18 billion in 2018 and is expected to generate around USD 3.71 billion by 2025, at a CAGR of around 7.9% between 2019 and 2025. The antimicrobial additives are majorly used in plastics, inks, textiles, papers, fabric care, paints and coatings, and rubber to improve their performance and durability. These additives inhibit the growth of odor and stain-causing microbes in the product and help in maintaining hygiene and freshness. Therefore, these additives enhance product performance by permanently reducing the negative effects of microbes. The rising consumer awareness regarding the increasing number of health issues is the major factor anticipated to drive the antimicrobial additives market in the upcoming years. Hygiene issues have become more prevalent across various developing economies. Medical devices use antimicrobial additives to prevent the growth of microbes on the surfaces of devices and equipment. These additives are used in the production of medical devices, such as guidewires, sheaths, access systems, diagnostic catheters, guiding catheters, etc., to avoid microbial growth. Furthermore, antimicrobial additives are also used in the packaging of products and help in preventing food, beverages, and medicines from spoiling. Therefore, the growing packaging industry is likely to positively influence the antimicrobial additives market in the upcoming years. By product type, the global antimicrobial additives market is segmented into organic (OBPA (OxybisphenoxArsin), DCOIT (4, 5-Dichloro-2-(N-Octyl)-4-Isothiazolin-3-One), triclosan, and others) and inorganic antimicrobial additives (zinc, silver, and copper). Organic antimicrobial additives held the major market share in 2018 in terms of volume. The organic additives are used in products and materials to offer long-lasting protection due to their extremely high activity rate and ability to interact with a large number of microbes in a short span of time. By application, this global market is categorized into plastics, textiles, paints and coatings, and pulp and paper. Plastics segment dominated the global market in 2018 and is likely to experience the highest growth rate in the upcoming years. The growth of various microorganisms, such as mold fungi, yeasts, mildew fungi, algae, and bacteria, causes discoloration and degradation of plastics. Therefore, antimicrobial additives prevent microbial growth and protect plastics. The paints and coatings segment is estimated to grow at the fastest rate over the forecast time period, as antimicrobial additives are used in various types of paints and coatings, specifically solvent or oil-based, water-based, and powder coatings. By end-user, the market for antimicrobial additives includes healthcare, packaging, food and beverages, construction, automotive, and others. The healthcare industry is anticipated to dominate the market in the upcoming years, owing to the increased product demand for manufacturing infection-prone products, such as tubing, surgical cables, and orthopedic sutures. By region, Asia Pacific held the largest share of the global antimicrobial additives market in 2018 and is anticipated to dominate over the forecast time period as well. This growth can be attributed to the rapid growth of the healthcare industry in China, India, Thailand, and Singapore. Additionally, the increasing government initiatives for improving healthcare amenities are likely to considerably contribute to this regional market’s growth over the estimated time period. Europe is estimated to be the second largest market contributor in the upcoming years, owing to the growing construction sector in Germany, Sweden, UK, Poland, Ireland, and the Netherland. Some major players of the global antimicrobial additives market are A. Schulman, Inc., BASF SE, Biocote Limited, AkzoNobel N.V., Clariant AG, King Plastic Corporation, Microban International, Ltd., SteriTouch Limited, Momentive Performance Material Inc., Milliken Chemical Company, Nanobiomatters Industries S.L., PolyOne Corporation, BioCote Limited, Sanitized AG, Life Material Technologies Limited, and Dow Chemical Company, among others.